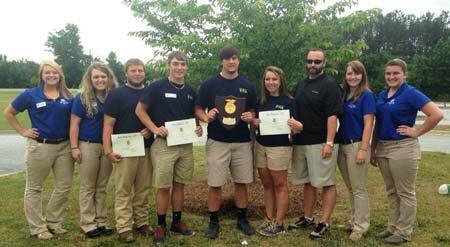 The Strom Thurmond Career and Technology Center FFA Turfgrass team took first place honors in the State Turfgrass Career Development Event (CDE) held at Piedmont Technical College in Saluda South Carolina on Saturday, May 17, 2014. Team members Lucky Bailey, High Individual Scorer in the state event; Karson Barrett, Third High Individual Scorer; Jonathan McCreery, and Clay Price successfully outscored six teams from high schools throughout the state. The team was coached by Jeremy Brooks and Darla Steele, Agricultural Education Teachers and FFA Advisors at Strom Thurmond Career and Technology Center. The contest consisted of a written general knowledge test, turfgrass chemical and fertilizer application calculations team event, sprayer calibration and application team event, live sample turfgrass identification, turfgrass weed identification, turfgrass insect and pest identification, and turfgrass equipment identification. The South Carolina State Turfgrass Career Development Event was planned and coordinated by the Agriculture Department at Piedmont Technical College.